Smaka means ‘taste’ in Swedish. And if I was to chose one word to describe the food served here, that would be it. When I moved to London, almost 7 years ago, Aldgate East was nothing but a huge building site: scaffolds, road works and lots of dust. There was not much to see, and even less to eat – apart from the odd chain coffee shop sandwich and some quite decent pub grub. But things have changed, scaffolds have gone and a cool new vibe surrounds what once was jus another old side of the city. And now there’s food. Plenty of it, and from all over the world. From (sexxy?) Italian pizza (go ahead, google it: they actually call it pixxa! ), to Lebanese classics, contemporary British and the new kid in town: modern Scandinavian. Scandinavian food has been hitting the headlines for quite some time now. From the worldwide success of the Michelin starred Noma, to the newest Instagram trend #hygge, all the foodies have gone North. And for a good reason: Scandinavian food is simple, fresh and close to the nature. 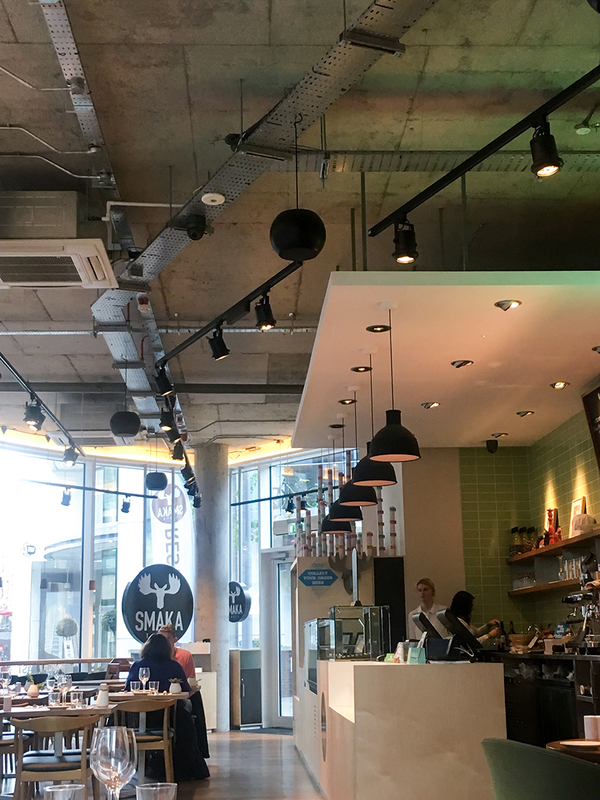 And Smaka delivers all of that, in a clean, friendly and open environment. But above all, Smaka delivers taste, and food that makes you feel like home – wherever that is. I went to Smaka for an early dinner, right after the Easter break. It was that kind of cold, rainy Tuesday evening, that calls for some good comfort food and a cocktail to match. Lingonberry cocktail? Yes please! 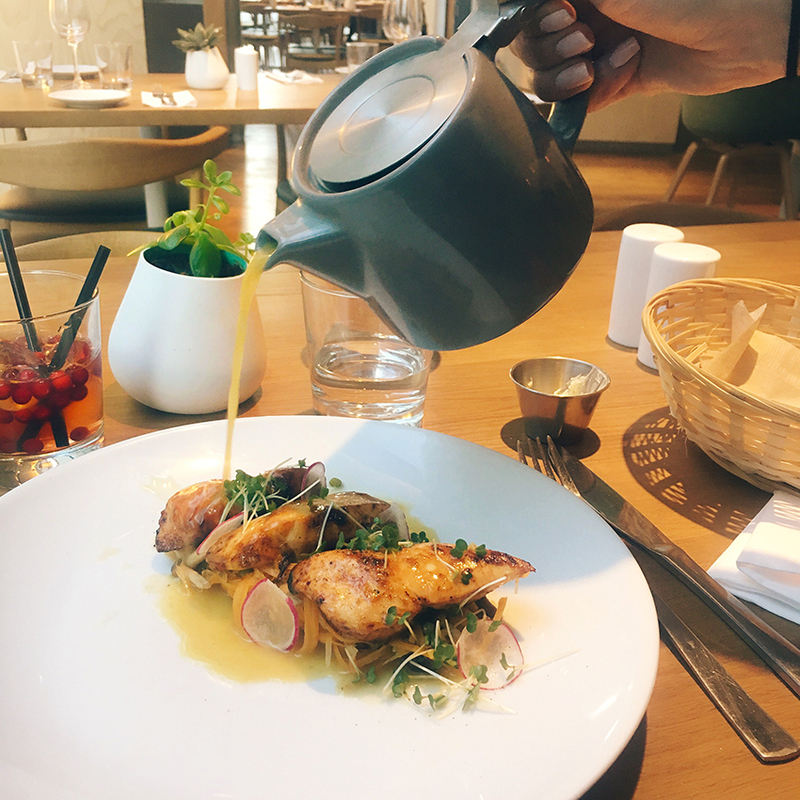 Smaka’s menu reads fresh, simple and seasonal. 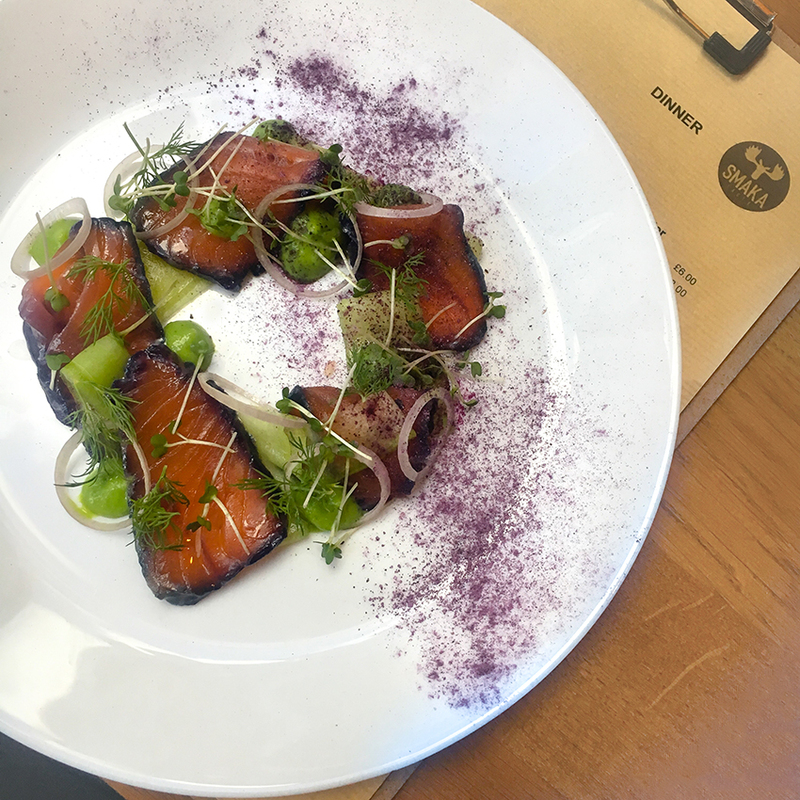 I start with a classic: cured salmon, herb and onion salad, pea puree and salted cucumber. What I love about a simple dish is that there’s no place to hide: you either master it, or you don’t. In this case, the salmon was beautifully cured, and paired perfectly with the slightly salted cucumber and the dill. At the main course I went for the cockerel with mung bean ragout and mushroom. It came accompanied by a warm jus which was rich, a bit sharp and full of flavour. The whole dish was light and homely – like a long hug that one needs at the end of a busy day. At this point, I wanted to know more about Smaka. So I did some research. And found out that Smaka’s Head Chef Adam Kallman was born in Skåne, Sweden. He has been working as a chef since the age of 16. In 2015, at the age of 22, he became Head Chef at restaurant Simsons Prästgård in Skåne. He previously worked alongside Anders Vendel at Sture, a Bib Gourmand awarded restaurant. In 2016 he competed in Sweden’s Chef of the Year as well as becoming an Ica culinary Olympic gold medal winner with the Swedish regional team Skåne Kulinar. That’s quite a long list of achievements for such a young chef. And no wonder his food tastes as good as it looks. The dessert was apple cake with cinnamon ice cream. Now apple and cinnamon is a classic. We all know it, we all love it and we all remember it as a childhood favourite. Well, or maybe not *all* of us (I know my father hates cinnamon – but this only means that there’s more apple pie for us, which is a good thing). But when I hear apple and cinnamon, my mind goes straight back to my mother’s kitchen and the unique warm scent that inundated the house when she cooked us an apple pie. Surely, Adam’s take on apple and cinnamon pie looks nothing like my mother’s. But in many way it is just the same: it is fun, playful, easy to eat. And when I taste it and close my eyes, I’m there. And that is what good food is all about. 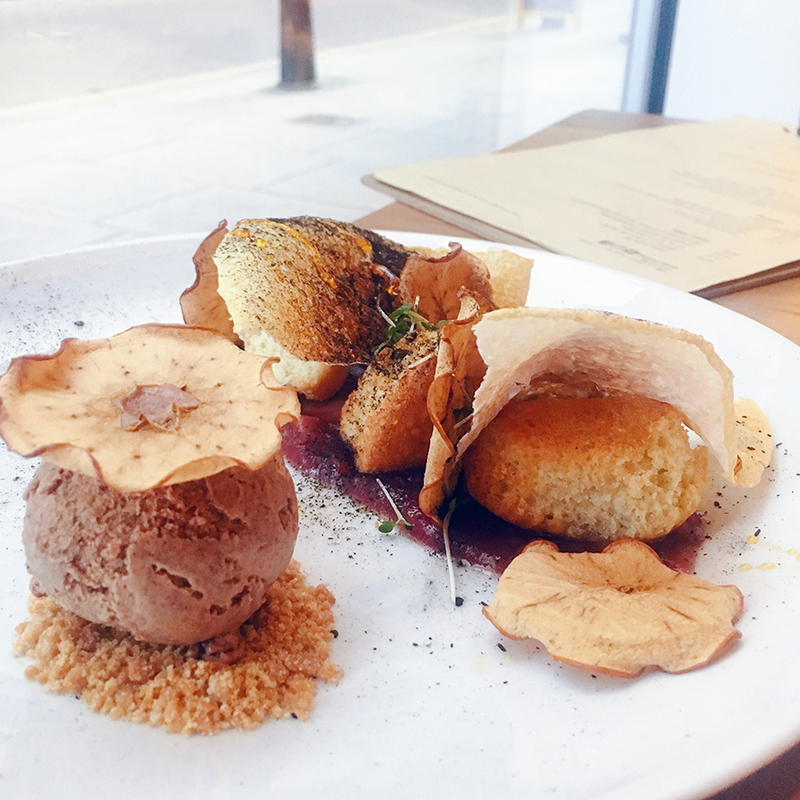 It is about being in London, in a Swedish restaurant, eating food cooked by a Swedish chef and feeling like you’re at home – wherever that is.